Along with cracking great business deals as a successful entrepreneur, you should be smart enough to make great savings in the electricity bills as well by using LED lighting technology. By using these LEDs at the commercial, industrial and even residential places, you will witness a steep decline on the overall electricity bills and among various types of options in the LEDs, you can install LED corn bulbs that are now becoming more and more popular among many various other form of lights. Install 20W corn LED bulbs instead of energy consuming metal halide (MH) fixtures. 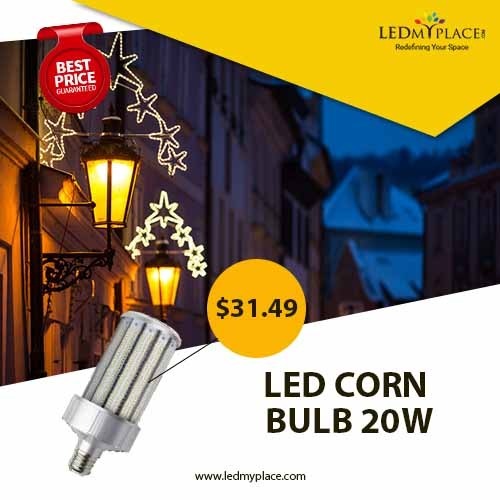 ● The latest LED Cob chips from Epistar are used inside these LED corn bulbs that will project light in the entire 360 degree angle thus covering the larger areas places as well. ● These 20w corn LED bulbs emit 2300 lumens and its color temperature is 5700K. ● You can replace 75w metal-halide bulbs with these corn shaped LED bulbs to make more energy savings. ● The CRI of higher than 80 allow you to make the displayed objects look more clear and visible. ● The base type of these 20W corn bulbs is E26 base that can make convenient retrofitting in existing fixtures with E26 sockets. Also after successful installing these bulbs, you can use them for at least 50,000 hours. ● 5 Years warranty from the Manufacturer’s end will make your investment more satisfactory. So use these LED corn bulbs that are eco-products and will give you great savings that you can use to grow and expand your business manifolds. Also let your clients as well as competitors know that you care for the environment as well by using these environment safe products.